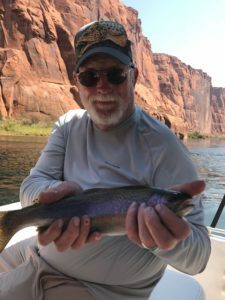 Lees Ferry Update: Fishing and Temps are Hot! 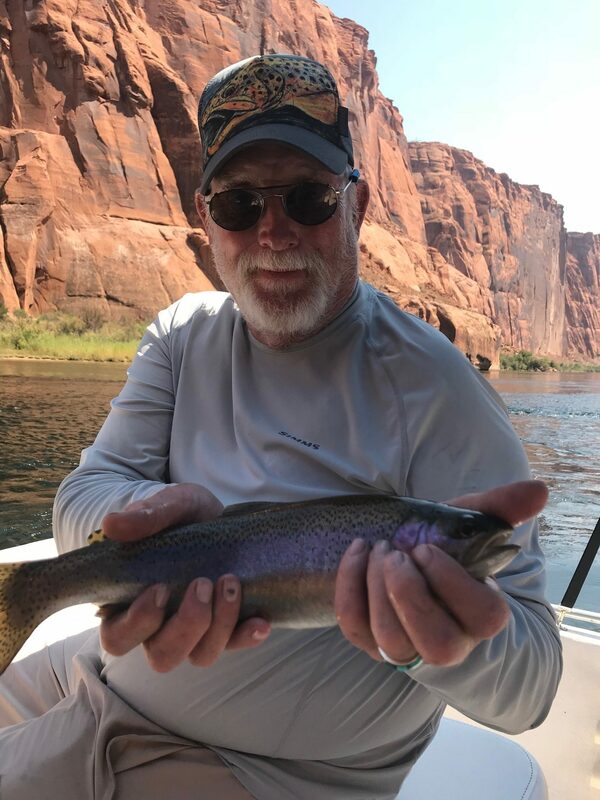 Mid- August is hot both in temps and fishing! The cicada hatch is slowing, but we’re still getting some nice fish to come up and hit the big dry flies on the surface. I had a client this weekend land fish on the cicada as well as on a midge dropper below the cicada. It can be tricky to cast with a dropper below the cicada as the combo will tend to spin and tangle if too many false casts are used. Most good fly fisherman can get used to using only one back cast when throwing cicadas, and it really helps reduce the tangle potential. Stretch yourself a bit and try throwing 30-40 feet of line without false casting; the odds are good you’ll surprise yourself with how well it works. Drift fishing from the boat is working well with high water during the week. As mentioned, try using cicadas (with or without a dropper), dry/dropper with Stimulators or Royal Wulffs over a zebra midge pattern, or a double nymph pattern with scuds/midges or double midges. 12-14 ft leaders and split shot are the ticket when double nymphing. Many nice fish are being caught using these options. If one approach isn’t working, try another, as fishing has been very good! The high weekday flows have reduced wading opportunities, but drift fishing has been very effective. For spin fishermen, fishing is great as well. Rubber worms and many lures are productive. Try Panther Martins, Kastmasters and bucktail streamers. Remember to drink lots of water and stay cool! We’ve had an increased number of monsoon storms on the river the past couple of weeks, with clouds moving in early afternoon. Keep your eyes and ears open on the river as you’ll see clouds building and may hear thunder in the distance, as well as increased winds. If you run into high winds and hear thunder, move your boat to a beach or anchor along a wall that’s protected from the wind and wait out the storm. Most of these monsoon storms roll through in less than a half hour, and it’s much safer and comfortable to wait them out rather than fight the wind on the water. Jack McGee crossing Lees Ferry off his “bucket list”!